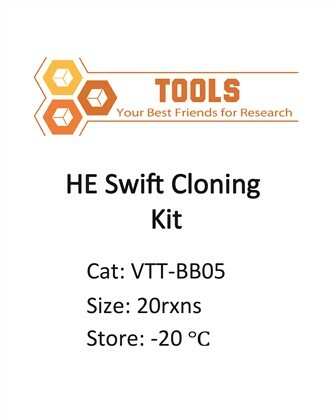 TOOLS HE Swift Cloning Kit is an advanced positive selection system for the highest efficiency cloning of PCR products generated with Pfu DNA polymerase, Taq DNA polymerase, or other thermo-stable DNA polymerases. Additionally, any other DNA fragment, either blunt or sticky-end, can be successfully cloned using the kit. Cloning is fast and efficient; ligation takes only 5 minutes and yields more than 99% positive clones. The kit features the novel positive selection cloning vector pHE. This vector contains a lethal gene which is disrupted by ligation of a DNA insert into the cloning site. As a result, only cells with recombinant plasmids are able to propagate, eliminating the need for expensive blue/white screening. The vector contains an expanded multiple cloning site, as well as a T7 promoter for in vitro transcription. Sequencing primers are included for convenient sequencing of the insert. Quick and efficient: Blue/white screening is not necessary, and the whole ligation process can be finished within 5 min. Sensitive and widely applied: Good for the ligation of low concentration fragments and long fragments, works for both blunt and sticky end product. 1. No need for blue white screening. 2. Ligation time: 5 minutes. 3. Suitable for blunt-end and sticy-end PCR product.